More than 50 members from the Lancashire Federation of Young Farmers dropped by Farmers Guardian today as part of a mammoth charity walk on route to this year’s annual convention weekend. Members have taken on the chairman’s challenge to walk 36 miles from their county office in Clitheroe to Blackpool Tower, while all dressed in cow onesies. Setting off at 5.30am from their county office in Clitheroe the 50-strong group began their 36-mile walk while all dressed in cow onesies. At 11.30am, after walking 19 miles and reaching their half way point, the first members began arriving at FG headquarters, based in Fulwood, Preston. Here they were welcomed in the sunshine by the FG team and local pub owners of the Waddington Arms, who had provided refreshments to support the cause and keep them going during their onward journey to Blackpool. Chairman James Oddie launched the ‘On the Moove’ fundraiser that will donate funds to Macmillan Cancer Support and Field Nurse. The fundraiser is in support of fellow member and FG livestock reporter, Louise Hartley, who is currently undergoing treatment for ovarian cancer. Mr Oddie said members wanted to show their support for a charity which is helping Louise. “Over recent years we have lost people close to our hearts through cancer, and now we have one of our own fighting the disease. 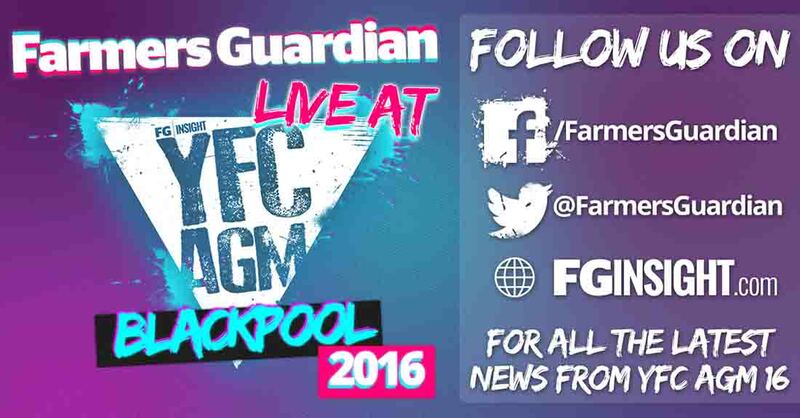 The Farmers Guardian team will be reporting live from Blackpool and the Winter Gardens, which is the venue where all competitions and events will be happening throughout the three-day weekend. Thousands of YFC members from across England and Wales will descend on the seaside resort to mark the biggest social event on their calender. The weekend will also see national competition finals including ballroom, choir and drama along with agricultural debate and the annual AGM, which takes place on Sunday. Next Article AGM 2016 - How fast can Young Farmers drink a pint of milk?